What Can Be Done to Prevent Another Stock Market Dive? For the past year, market watchers have had a growing unease about something called high-frequency trading. The fear was that largely unchecked supercomputers trading in nanoseconds and set on autopilot could cause the market to plummet for no real reason at all. On May 6, those fears were realized when the market plunged hundreds of points in less than 20 minutes. It's still not clear exactly who or what started the drop. But what is clear is that even if a computer glitch or a trader's goof got the ball rolling, the structure of the market turned one bad trade into a market collapse. At the heart of the problem is a decade-long push to lower the cost of buying and selling stocks. That was supposed to lure individual investors not wanting to pay hundreds of dollars a trade into the market. But the result seems to be a herky-jerky market for stocks that individuals can now afford to be a part of but increasingly don't want to. Even before last week, the Securities and Exchange Commission was soliciting comment letters from market participants about what should be done to fix glitches that could occur in the increasingly computerized and fragmented market. There are a number of ideas floating around Wall Street. Not everyone agrees on what should be done. But what almost everyone believes is that we need to do something to fix the market. "Our current stock market model is broken," says Joseph Saluzzi, co-founder of Themis Trading, who has sounded the early-warning signal on high-frequency trading. "If we don't do anything, this will happen again." 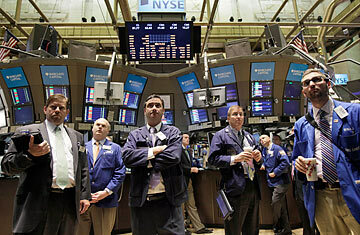 During the height of the market panic on May 6, the New York Stock Exchange (NYSE) stopped trading. That wasn't a mistake or glitch; it was on purpose. It's called a circuit breaker, and it is supposed to calm the market. Traders and regulators can step in and see if a mistake has been made. Most important, it is supposed to help buyers get into the market who might otherwise not want to buy in as everyone is scrambling for the exits. But on that day the NYSE's brief pause did the opposite: it made the situation worse. That's because the NYSE only accounts for about 40% of the trading volume of stocks these days, down from nearly 100% a decade and a half ago. The rest of the buying and selling occurs elsewhere on various electronic exchanges, including the Nasdaq and many others. So when the NYSE shut down, it didn't cause stocks to stop trading as it would have done in the 1980s or even the early 1990s. All it did was make the market function more erratically. With 40% of the volume of the market closed down, it became harder and harder to find willing buyers. Stocks that were already headed lower began to nose-dive. The solution is not to have market-based trading halts, but stock-based trading halts. So if Procter & Gamble were to fall $20 in mere minutes, as it did on May 6, regulators would stop the trading of that stock everywhere, not just on the NYSE.